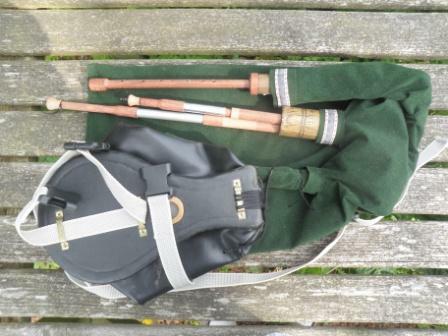 It is only the 2nd time I have attended the Newcastleton Folk Club, but the piping there is increasing each time, last Tuesday evening there was Irish bellows-blown pipes and 2 sets of Scottish Small pipes. I feel it is important to include the titles of the tunes as we do not often record what we play and this can be of interest to future researchers. Each person played or sang in turn, when it was my turn I played “Frisky” and later I played a Minuet both pieces were from the Peacock manuscript, which is a manuscript written especially for the Northumbrian small pipes, dated 1800. 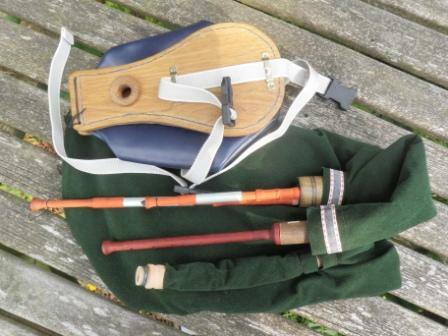 As my time came around again I did a duet with David (who was also playing bellows small pipes) the tune was called “Noble Squire Dacre” with 6 variations and this was followed by the Scottish version of “Buy Broom Besoms” from the manuscript “O’er the Hills and Far Away”, a compilation of tunes from the Scottish Borders. 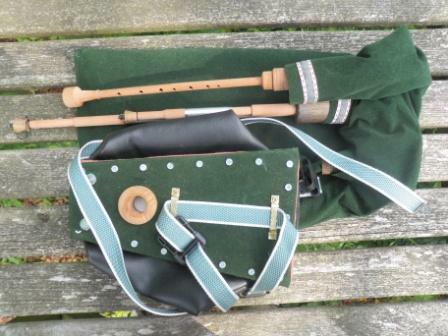 Later I played “Green Bracken” a melody with 3 parts, and later again I played “Kelso Lasses” next to “The Wedding O’Blyth” both tunes are from the “O’er the Hills and Far Away” manuscript. David played pipes and sang which is something I love to hear, but I do not know the title, the Irish piper played some beautiful Airs and reels, some I knew but again I do not know the titles. 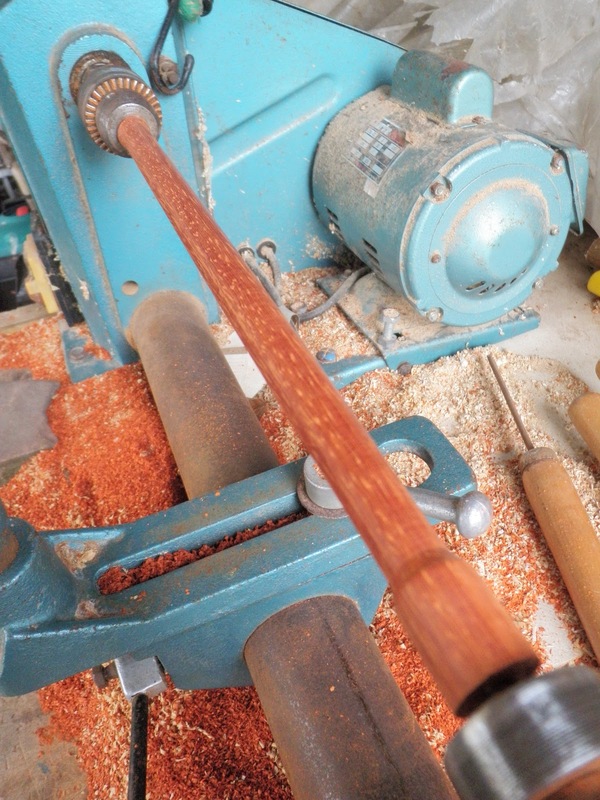 Turning the drilled piece of red wood after it has been bored makes it “chatter” (vibrate) especially in the center, so care is needed to steady the wood with the hands as one turns down the wood to the thin diameter. 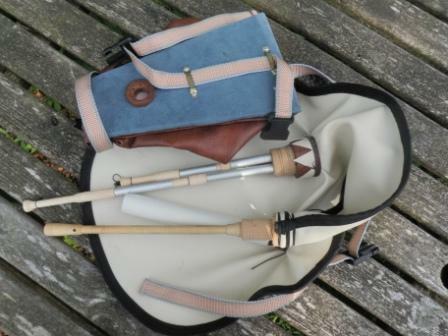 I am trying a different design with the reed stock so I went away from the traditional measurements. 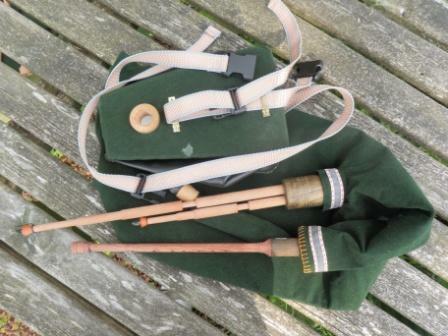 The reed end of the chanter fits into a “reed stock” so the chanter can be removed while the reed is still in the bag/stock. 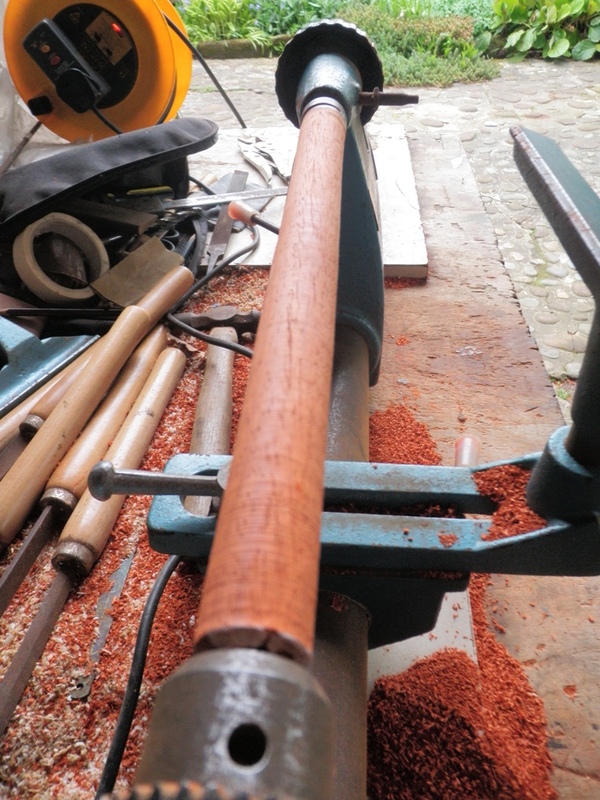 I do not have a metal work lathe yet, so I turned the form down with the chisel then finished off with rough sandpaper to get the thickness even along the chanter, this helped to reduce “chatter”. 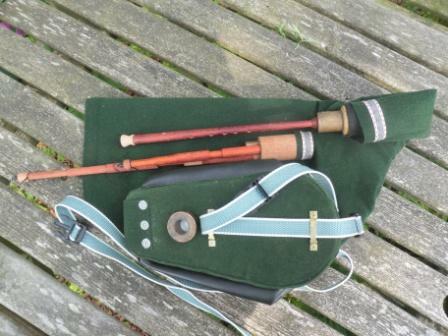 The bottom end of the chanter is a little thicker to the top by a few millimeters. 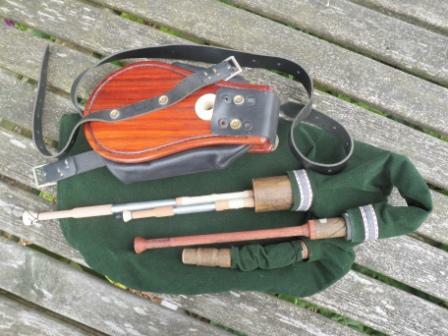 My need to play indoors in Spain requires me to have a quieter chanter that has a flattened 7th note. 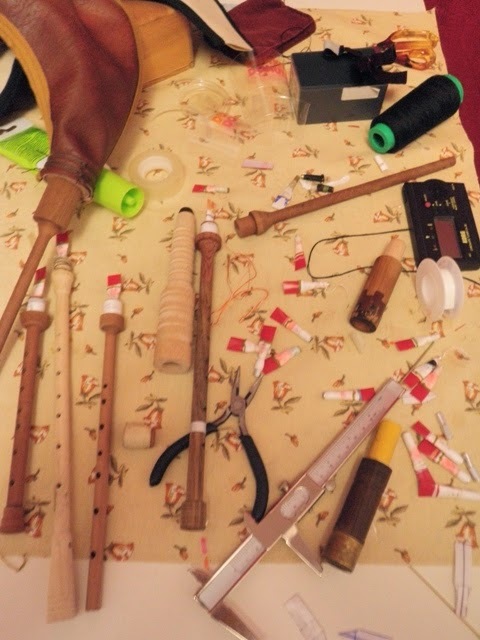 My Northumbrian Small Pipes have a sharpened 7th and my Border pipes have both but they are too loud for a small room with neighbors. So I bought a hard wood called “Santa Rosa” a deep red wood, beautiful colouring that slowly turns a darker colour as time passes. I began by boring the wood end to end with the lathe, and achieved nearly a perfect bore with only slight wandering of the drill bit.